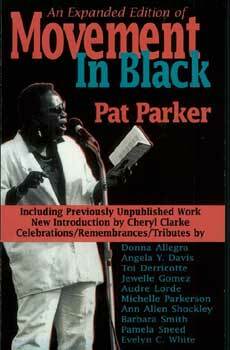 Editor's Note: I had the opportunity to see Pat Parker give a powerful peformance with her Movement in Black performance troupe in the late 80s on the main stage at the New England Women's Musical Retreat (NEWMR) Soon after that she died at at age of 45. I always dug school. It was my one freedom. I sent to school, and we went to church. And that was it. So school was the better of two evils. But I dug the learning, the reading, and writing. And I did a lot of public speaking when I was in school. I would narrate all the school programs. They'd give me this long program of about twenty pages, and I'd memorize it. Yes, that gave me a lot of self-confidence, and it got me a lot of little favors also. The teachers all liked me. And it definitely worked toward developing my speaking voice, you know? It was weird too because the kids used to-Well, they not only laughed at me, but I often got beat up because I didn't have a Texas accent. They said I was putting on airs, so I often had to get home a lot faster than I wanted to! I grew up in Houston. 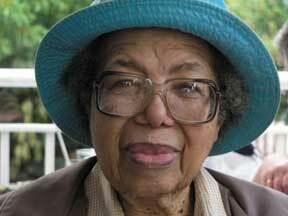 I was born in what was called the Third Ward, a Black part of town, and we lived in Parkinson. When I was four we moved into what is called Sunnyside in Parkinson. There were no other houses around for blocks-just weeds-and we used to pick blackberries and play in the weeds and kill snakes. It was like being in the country until other people starting moving in. The house we lived in had real small rooms and there were four children at home then. So my mother knocked all the walls out and transformed the house into this one big room, it was like living in a cabin or something. We had an outhouse as there was no bathroom in the house. And I can remember being afraid to go to the outhouse because I was scared of the animals that inhabited the neighborhood. At seventeen, I left home. 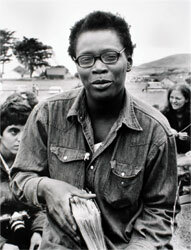 First I went to L.A. to the City College there, from 1961 through 1963, because my sisters were all there. Then I got married and went with my husband to San Francisco. I got married when I was 18 and stayed married for 3 years. I think I left my husband about 8 times, but people would always tell him where I was. I'm one of those people who didn't believe in putting my business on the street. We were having a lot of problems, but nobody ever knew about it. They always thought we were such a good couple, a happy couple who never had any problems. So they would tell him where I was, and he'd always come and get me. And I was terrified of him! Oh, yes, I was scared to death of him. Then I finally decided, 'Well he can't keep doing this. You're going to get killed or something.' You see, my parents never really dug my first husband because he was a writer and didn't work at a steady job like they thought husbands were supposed to do. And my father had always put it out to all the men that my sisters and married that he wouldn't tolerate them hitting on his daughters. And he had always told us to come home if they hit us. But there was like a pride thing involved in that I couldn't admit that this was happening to me, you know. I couldn't let my family know what was happening. And I was also very young and naïve and ignorant, you know? Yes, I did it a second time, which was totally absurd, you know? But I think there was this hidden thing in me fighting off Lesbianism. I had had this thing with a girl when I was about eleven-from about eleven to seventeen-and my parents found out about it. Their reaction was highly negative. Very negative! I was told, 'Don't ever do that again. So I decided during my second marriage that it wasn't me, it had something to do with the whole idea of marriage that was strange. And I knew it wasn't working for me! So I finally took off. I went back to Houston. I decided that I would go back home and write a novel. During all that time, I was still writing, you know? I started writing when I was a child. I'd make Mother's Day and Valentine Day cards and write little poems on them for my mother and draw some funny pictures. I don't know why, but I always had this idea ever since I was a kid that I was going to be a writer. That I was going to write a novel-I always thought about it in terms of prose. My first husband was a prose writer, and he used to tear up my prose! I'd write a story, and he would rip it apart! So I got tired of that. I decided that I would begin writing poetry because he didn't know anything about that. When I started, I found that I liked the medium better. It was easier to work with. I wrote some poetry while in high school, but it was mostly little limericks. I was mainly into journalism when I was in high school. I was going to be The Writer! Ha, ha, it was a trip. But I had some encouragement from the teachers, you know. The journalism teacher really got behind me. She made me the editor of the paper when I was a junior, and that was the first time that had ever happened. Also, it was the first time a female had been editor of the paper, it seems. I was also the editor in my senior year. I was the only person who ever did it 2 years in a row which a lot of people thought was kind of strange, you know? How do my sisters feel about me being a writer? Well, they're quite pleased. For a long time my mother kept giving me this thing about getting a job and going to work and living a normal, decent life. But once I published my first book, it was accepted that I am a writer, and that is my work. It's a little strange, but I'm good at it. It's legitimized now that I've been published, you see.